Back to the grind... sorta. I figured I better hop on here and send my well wishes before all the craziness starts... The hub's parents arrive this afternoon, so from then on out it's full speed ahead - Christmas style! I hope all of you have a wonderful Christmas! This year we are going to the Christmas Eve service at church and then hosting a casual Christmas Eve dinner back at our house. Then we'll be heading over to my parents' house on Christmas Day for Christmas dinner. (How many times can I say Christmas?!) 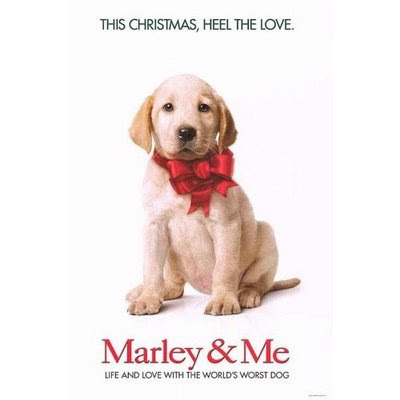 And then to the theatre to see Marley & Me later that night! But shhh... don't tell my mom - it's a surprise! I tried posting it here but my non-tech-savvy-self couldn't get it to work. Check out this post for a fabu Christmas jig from my three sillies. P.S. This is post #300.... Wowzas! I have that same content, yet longing feeling I had after the 7th Harry Potter book. OK, not NEAR the emotions I felt after finishing Harry. Seriously, I saw a guy in the airport with the 7th book a good few weeks after I had finished it and I just started crying. Right there on the damn escalator. Again, LOVED the ending to HP, but was so sad it was the end. I've already hopped on Stephenie Meyer's site to read the unedited snippet of Edward's POV from the first book, but I've got to put it on hold for a few days... because I've got to get Marley & Me read in time for the movie next week! Alright well I've got lotsa work to do here. We've got our Christmas party tonight down at the Aquarium, so I've gotta get outta here early. Another whirlwind of parties this weekend! Hope y'all have a good one.... TGIF!!!! But ladies, behold! ELF has come out with its own version of this fabulous automatic pencil for only $3. It's part of their new Studio line... you know, the more *uppity* line that goes for $3 instead of $1. So anyway, when I reordered my supply of mineral makeup the other day, I added one of these new liners to my shopping bag to test it out. Could this be as good as my tried and true Estee Lauder version? I mean I have not switched to anything else in 17 years, people! That doesn't mean I haven't tried other things! Is that you? Hi, it's me - Buford Betty! I know, I know... I've been away for SO long! My last post was about turkey day and now we're about to smack right into Christmas! My December has just been so busy - as it always is. The string of holiday parties started last Saturday and well, it's non-stop till Christmas. We literally have a party (at least one) EVERY Saturday and Sunday till Christmas - and even some Fridays. No rest for the weary! I don't know why this surprises me every year... but it happens every December. Well, we did have a fabulous Thanksgiving. We were over at my godmother's for Thanksgiving dinner. And then the hub and I headed up to Tennessee to visit with his parents for the weekend. It was a great long weekend. Oh and did I mention that I went Santa shopping with my mom the Wednesday before? Yes! That little taste of shopping was a bit dangerous though. Even though Santa was buying, it wasn't good for me to smell those lovely retail smells and see the incredible bargains to be had up close and personal. I'm much better left in the dark. Out of sight, out of mind y'know. But I got some super cute stuff from Santa - well, I don't have it yet, but anyway - yeah. That makes me think of a Santa question... I think I'll add a fun little poll on here (note to self). 1. How much do I love Costco? More than you know. Our torrid love affair gets hotter and sweatier everyday. So I only recently discovered (or paid attention really) to the fact that you can get movie ticket vouchers there for $7.50. And there are NO exclusions. AND they're good for IMAX movies! Our local theatre has an IMAX screen. So the hub and I budgeted for a date night this month because he wanted to see that alien movie thing with Keanu Reeves - The Day the Earth Stood Still or whatever. Yeah, totally his pick. Anyway... our theatre has it showing on IMAX. So my old non-budgeting self would have gone on Fandango to get tickets - and those would've been $34 for two (after the fees and junk). BUT my shiny new budgeting self got two vouchers from Costco (you just ask for them at checkout) for $15 and went over to the mall yesterday to trade them in for our tickets. So I saved $19 by doing that - hellz yeah! Three cheers for Costco! 2. That leads me into what's on tap for this weekend... Friday night is date night with the hub. Saturday morning we're running the Jingle Jog 5k. Any other peaches running?! Gertie will be running alongside me with some Christmas flair - I promise to take pics! Charlie was supposed to run, but he has managed to injure his knee. The hub was at the vet with him yesterday. He's on some pain meds and we're just watching it for now, but the run is definitely out. Poor Charlie - say some puppy prayers for him! So does Belly get to take his place? Well, I say heck no because she is an absolute pill to run with... but she is daddy's girl and the hub is saying he's taking her. That's fine - he can run with her. Here's bettin' he tosses her into a garbage can before mile 2. Oh and I got some awesome Christmas knee-high socks for the occasion. I will take some pics of those too. Then SaturDAY I'll be in a wrapping frenzie! Frenzy? However you spell it. Saturday night we have a Christmas party at a friend's house... Church Sunday a.m.... A kid's birthday party at noon... and then our small group Christmas party Sunday night. Phew! 3. I'm almost done reading Breaking Dawn. I flew through the first three books, but had to slow down on this last one since we've been so darn busy lately. I don't think I ever mentioned my thoughts on the Twilight movie either... I thought it was good, not great. Liked, not loved. Edward was completely drool-worthy and worth the ticket price alone, but as with most movies based on books, the book is soooooooooo much better. I think, just the way it's written, it's so hard to translate that on film - especially in a 2-hour window of time. I don't think the intensity of Bella and Edward's relationship comes through. Though I have to say, I did find Jasper freaking hilarious. He's like Edward Scissorhands, minus the scissors. So I have a new-found love for Jasper after seeing the film. So overall... if you haven't read the book, I'd skip it. I just don't think I would've "gotten it" if I hadn't read. I mean I love me some vampires (again - tried and true Buffy fan here), but I think the movie was lacking. Oh I'll still totally buy it on DVD so I can look at Edward.... but yeah... I'm hoping they put a little more edge into the second film. Sounds like they're trying to spit that one out by the end of next year. Melt the butter and mix all the ingredients together in a bowl. Pour into a baking dish. (I've done this both in a regular 9x13 dish and a square dish (9x9) and I think it comes out better in the 9x9). Bake at 350 for 40-45 minutes. Yum-o!!!!!!!! 5. Wait, one more... Back to my thoughts on a poll re: Santa... So when I was growing up (and I guess I still am because Santa still comes if we're spending Christmas at my parents' house), Santa would lay out my gifts - all across the floor, all along the couch, whatever the case may be. He didn't wrap. Now Mom and Dad's gifts to me were wrapped and under the tree, but Santa came and left everything out unwrapped. I realize this is a heated debate... much like real vs. fake Christmas trees, or which way the toilet paper is supposed to hang, but I must ask, What does Santa do (or what did he do) at your house? Wrap or not?